The bet-at-home group has over 4.3 million customers from around the world across several online gaming and sports sites. The subsidiaries of this company make it one of the most popular online casino providers in Europe and it’s even on the Frankfurt Stock Exchange. There’s a big range of different gaming options available at bet-at-home.com including online casino games, poker and sports betting, with more than 345,000 events across 75 sports offered each day. With more than 200 employees and offices in Germany, Malta, Austria and Gibraltar, bet-at-home.com has enjoyed huge success. The Maltese companies hold licenses, which allow this online gaming provider to offer online gaming to players around the world. Founded in Austria in 1999, this company originally focussed on just sports betting. However the founders Franz Omer and Jochen Dickinger managed to put together a detailed and substantial growth strategy spanning the last 15 years or so, which has allowed the company to expand extensively. In 2015 the subsidiary companies of bet-at-home.com had a huge betting volume of over €2,410 million and gross profit of over €121 million, numbers which many other online casino operators can only dream of and which show the resounding success of the company’s activities in the last few years. Stocks for this online casino operator can be found in the Entry Standard area of the Frankfurt Stock Exchange. 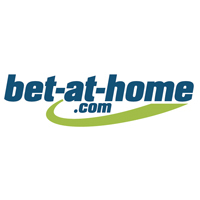 Bet-at-home.com AG is the parent company of many other branches of the group and is based in Dusseldorf where it is responsible for the stocks of the group. This company holds 100% of bet-at-home.com Entertainment GmbH, which is based in Linz, and this branch works on developing software and new technology. Business activities in Malta are carried out by bet-at-home.com Holding Ltd, a member of the French Betclic Everest group, which works exclusively in the online gaming industry.